Many of us in Kitchissippi still have memories of the good old days of the Elmdale Theatre. In some ways it seems crazy that it has been now more than twenty years since it closed in 1994, unable to compete in the fast-moving and changing business of movies, with huge megaplexes, constantly evolving technology and a greater demand on overall movie-going experience. The little two-screen Elmdale at the corner of Wellington and Hamilton just couldn't keep up. Nor could any of its companions like the Somerset and Elgin. And it really is unfortunate that it could not. 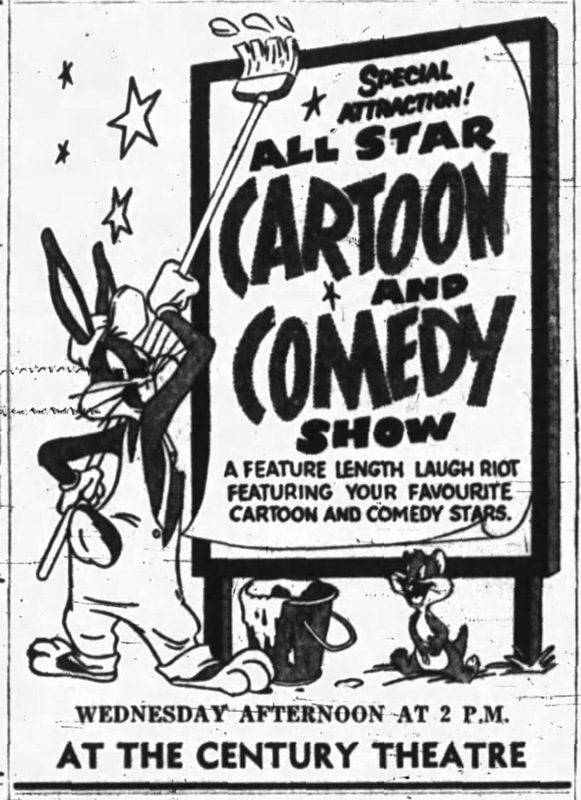 The youths of Kitchissippi today will likely now never experience going to a movie in this neighbourhood; an experience now requiring a long bus ride west (to the Coliseum), south (South Keys) or east (Silver City) to take a date and see a movie. Even all the downtown theatres are closed. A tragedy. At least we at least still have the Elmdale Theatre building to look at (or maybe not, after all it is a daily constant reminder of what we've lost). But besides the Elmdale (which I'll surely cover some day more extensively on this blog), I wanted to briefly talk about a different movie theatre which I'd bet 99.9% of Kitchissippians don't ever know existed, and equally would be hard-pressed to even try to picture where it once stood for nearly 40 years. In the early 1930s, Wellington Village was exploding. The Ottawa Land Association had finally sold off all the lots in the early 20s (after sitting on the land for 30 years) and the roaring 20s saw a huge boom in construction on streets on both sides of Wellington West. Even the depression did not slow development too much, and by the 1930s, there was a great movement afoot for commercial interests to move in to the area and take advantage of a lack of infrastructure such as shopping, grocery stores and most notably, entertainment. 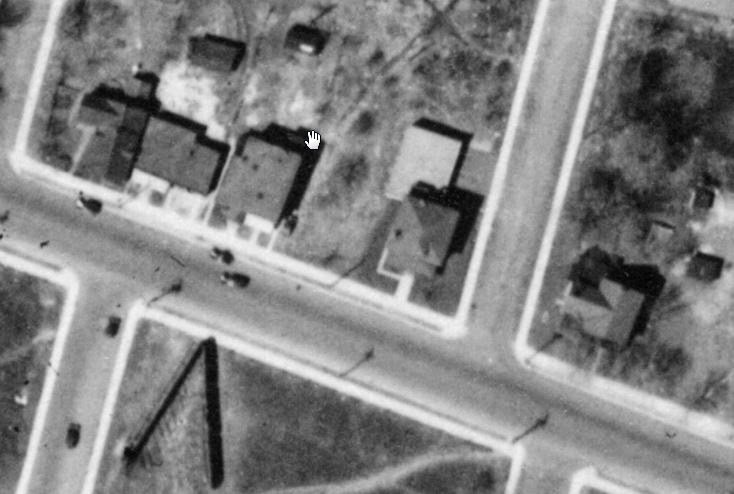 Aerial photo from May 5, 1933 of Wellington Street. Huron on the right, Caroline on the left. Hintonburg had a theatre since 1914 at 1045 Wellington Street (now an empty lot next to the Wellington Towers apartment building across from the St. Francois D'Assise Church), but west of this theatre, there was nothing. 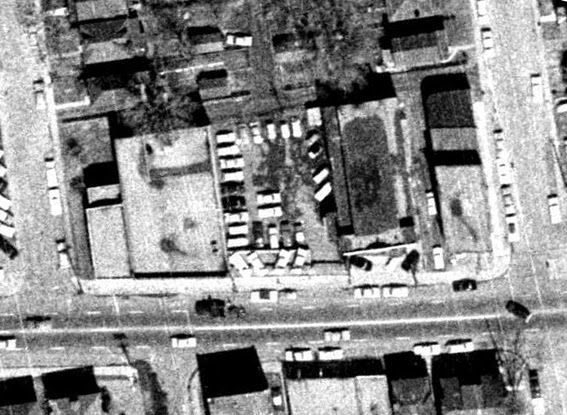 So in the summer of 1934, construction of a new movie theatre began on a large empty lot on the north side of Wellington Street, between Huron and Caroline. The 800-seat theatre was built by a business called the "Wellington Amusement Company", at a cost of around $38,000. The general contractors for the job were a little-known Ottawa business, the Ottawa Construction Company (president Edgar Proulx). Walls, tiling, ceramic floors and steel windows were supplied by the F.H. Emra Company, specifically highlighting their use of haydite, a lightweight concrete, for "perfect sound" and acoustics. The seats installed were the Interior Hardwood Company's patented "Self-Tilt Theatre Chairs, which are roomy, comfortable", and were equipped with the Dunlop Tire and Rubber Goods Company's "Dunlopillo" cushioned seats "which mould themselves to your figure" and "never heats, as each unit is self-ventilated. As soon as it is released from weight, it springs back to normal shape." 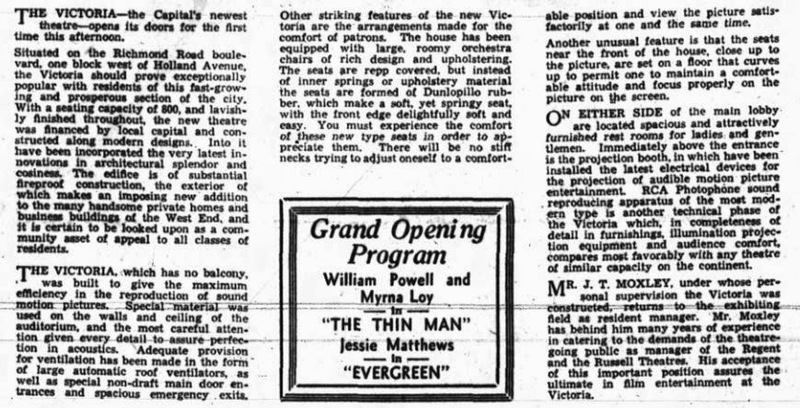 The grand opening was held on Saturday December 1st, 1934 with 4 showings of the movies "The Thin Man" and "Evergreen" at 12:30, 3:00, 7:00 and 9:00. Programming consisted of two changes weekly of double-feature programs. The prices weren't too bad either: Admission to matinees on Saturdays and holidays were 10 cents for children and 15 cents for adults; while for evening performances, of which there were two each night, at 7 and 9 p.m., was 25 cents for adults. The Ottawa newspaper at the time related the importance of the theatre: "As a theatre has become an essential feature in neighborhood community life it is natural that the West End merchants are keenly interested in the success of the "Victoria" which is a welcome addition to the social life of one of Ottawa's most progressive districts". The Victoria was indeed an instant success in the community. 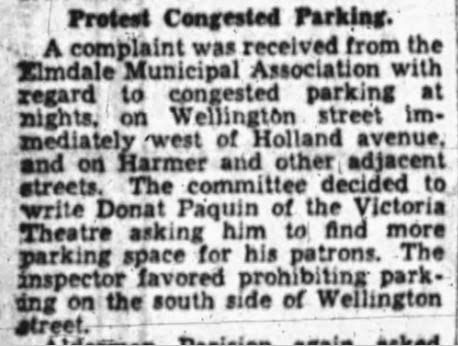 So much so that within less than a year, already the community association and politicians were concerned about parking issues which had developed along Wellington Street. The obvious solution of course: ban parking on Wellington Street! I don't know how they resolved the issue, but this was merely a blip in a successful start-up of the local business. Somewhat oddly, only four months after opening, the Wellington Amusement Company sold the theatre to well-known Hull-based theatre operator Donat Paquin for $40,000. Paquin would be the one to run the theatre for the next 13 years, the golden years of Wellington Village's development. building can be seen in the background at right. 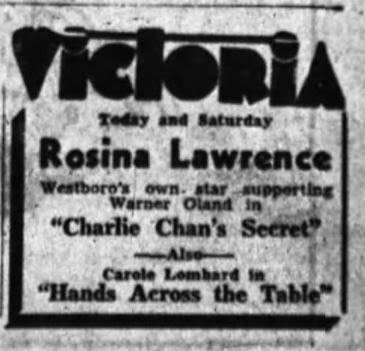 In August of 1936, The Victoria showed "Charlie Chan's Secret" starring Rosina Lawrence, who spent her childhood years on Wilmont Avenue in Westboro before moving to Hollywood and starring in several major movies. 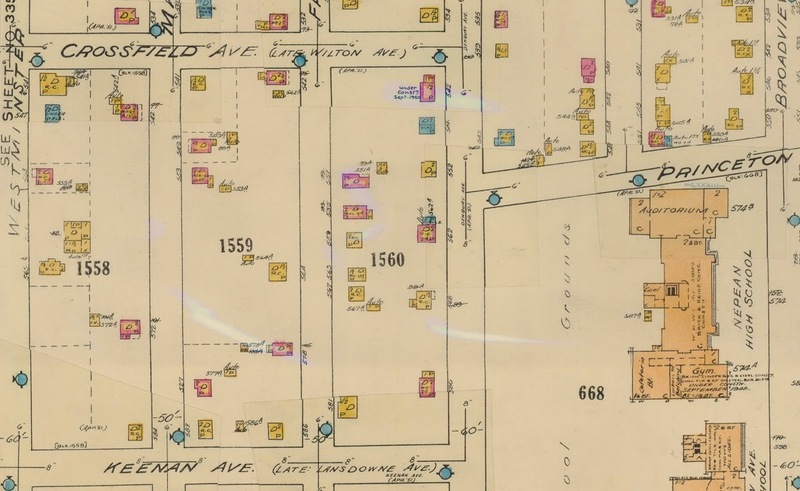 Below is a really cool fire insurance plan view from 1948, showing the block between Caroline and Huron: the Royal Bank (now Flock Boutique), Loblaw Groceteria (now St. Vincent De Paul), the Century Theatre (now the large apartment building), and Higman's Hardware & Paint Shop (now Thyme & Again). The Victoria would later be purchased by Twentieth Century Theatres in 1947, and would be renovated (with air conditioning) and reopened as the Century Theatre in 1948, to compete with the Elmdale Theatre (which had opened across the street in 1947). It lost out, and after a brief stint as the "Towne Cinema" from 1954-55, sat vacant for two years (it was considered an option to deal with the overcrowding of Fisher Park High School in 1956), re-opened as the Towne briefly during the winter of 1957-58, was a temporary lodging site of the Parkdale Baptist Church during renovations in 1958, and finally re-emerged as a car dealership and service centre in December of 1958 (Paul Cardinal Ltd., dealer of Austin cars). Cardinals would remain open until 1969, replaced by Jack Samuels Garage for a few years, until it was torn down around 1975, and replaced with the apartment building which is still on this spot today. I hope you enjoyed this article, and maybe you'll view this spot on Wellington a little differently now! I've only really covered the basic history of the theatre. For more information, a more comprehensive history of the theatre is covered excellently in a great book written by local Ottawa historian and movie theatre expert Alain Miguelez, "A Theatre Near You". If you have not seen this book yet, I encourage you to seek it out. Easily one of my 3 favorite books I own. It is nearly 400 pages of well-researched and wonderfully-described stories and details of every theatre in Ottawa's history. More photographs than you can imagine, and you can tell he has put his soul into this book. There are 4 pages on the Victoria Theatre alone. This week I am looking at the history of Fraser Avenue which is in the McKellar Park-Westboro area of Kitchissippi. This is a street which may have a lot more history in it than you can imagine. Part of this street was once a golf course. All of it was once a farm. Street cars ran through it for 60 years. It was the site of a deadly train wreck of new Canadian immigrants. And most importantly, like the neighbourhood which surrounds it, the street has developed into a place that families can call home for many years. Many move on to Fraser and remain for multiple generations. Name meaning: Was named after Robert and Mary Ann Fraser, one of the first (and long-time) builders and residents of the street. Their home (551 Fraser Avenue) remains standing today as a McKellar Park landmark. How named: Nepean Township worked with the Canadian Post Office Department in 1944 to established improved addressing for the introduction of mail delivery in the suburbs. As a result, large-scale home renumbering and street renaming took place. At this time it was also known that annexation of Westboro to the City of Ottawa was imminent, thus a Bylaw was passed in April of 1944, changing the names of many streets in Kitchissippi. The large majority of streets were given new patriotic names. All of the numbered streets in the McKellar Townsite subdivision were assigned proper names, in some cases recognizing long-time, pioneering families of the suburb. Fraser Avenue was one of these streets named to memorialize the important and well-loved Fraser family. 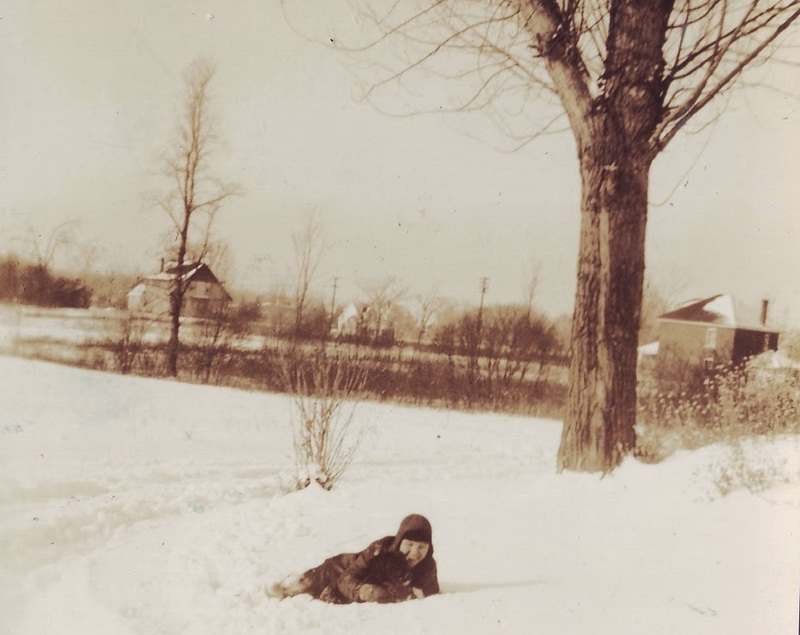 The McKellar Park neighbourhood, of which Fraser Avenue is the original/historic eastern border, has it's earliest roots dating back to 1873, when 60-year old dairy farmer Archibald McKellar purchased 266 acres of land in west Kitchissippi. McKellar was born in Scotland, and had come to Canada just shy of his 30th birthday. He had established a successful dairy farm on leased land on the Billings Estate in the east end for the previous 30 years; the Kitchissippi purchase was his first instance of owning property. 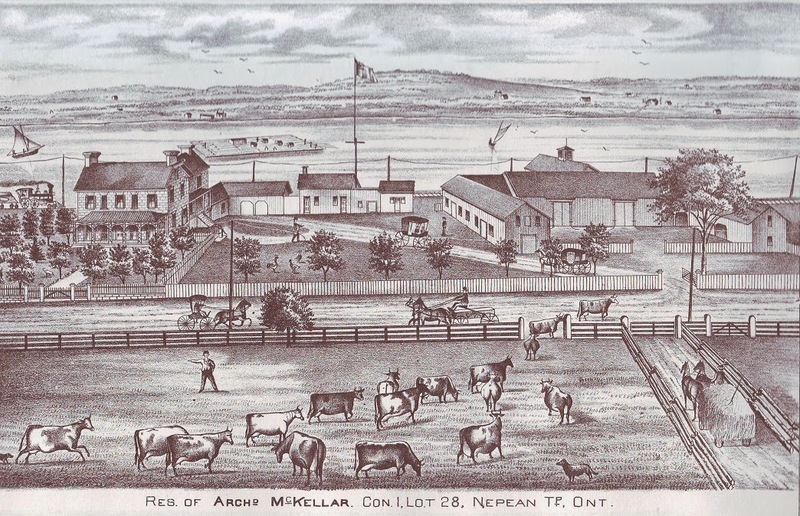 The McKellar's new farm had already been in existence for many years, dating back to the Thomson family (they of the Maplelawn-Keg Manor fame). Along with acquiring the land, McKellar purchased the large stone mansion on the north side of Richmond Road (built circa 1840). He modified the home a little, but ultimately it looked the same in the 19th century as it still does now (on Richmond Road, near the foot of Windermere Avenue, better known as McKellar-Bingham House). Below is an amazing illustration of the farm from Belden's 1879 Atlas of Carleton County. So many details! From the train (on which was then the Canada Central Railway line), the buggies on dusty Richmond Road, the square timber raft, etc. the top left which still stands on Richmond Road today. Archibald McKellar passed away in 1889, and willed the farm to his only son, John McKellar, who was 45 years old at the time. John and his two sisters still resided at home, and all three were unmarried (I suppose the options for courting and marriage in this era were very limited, particularly on the relatively isolated farm). John McKellar and his sisters kept the farm going for another 22 years. and Maplelawn top right, and the cluster of trees lining Richmond Road. 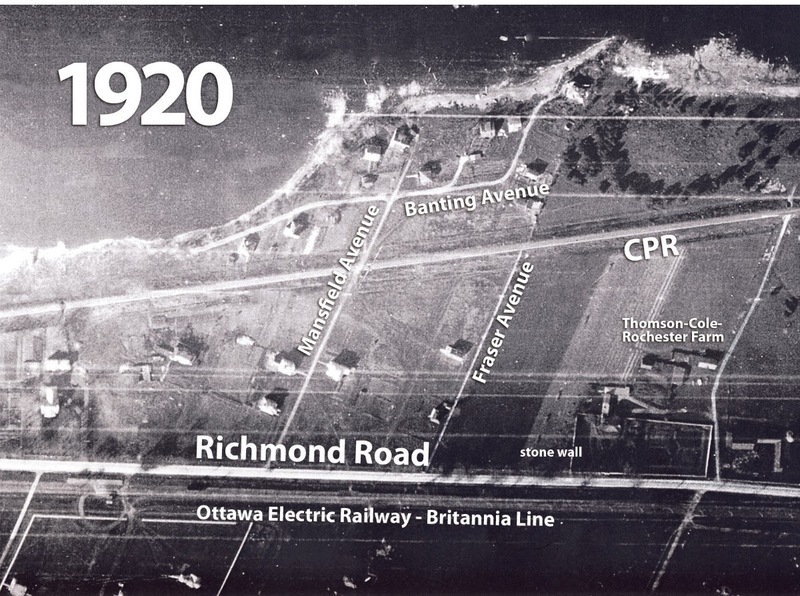 In 1899, McKellar sold a portion of his farm land to the Ottawa Electric Railway, who were extending streetcar out to Britannia. The rail line split the McKellar farm near the north end when it ran its first trial run car on December 18th, 1899. 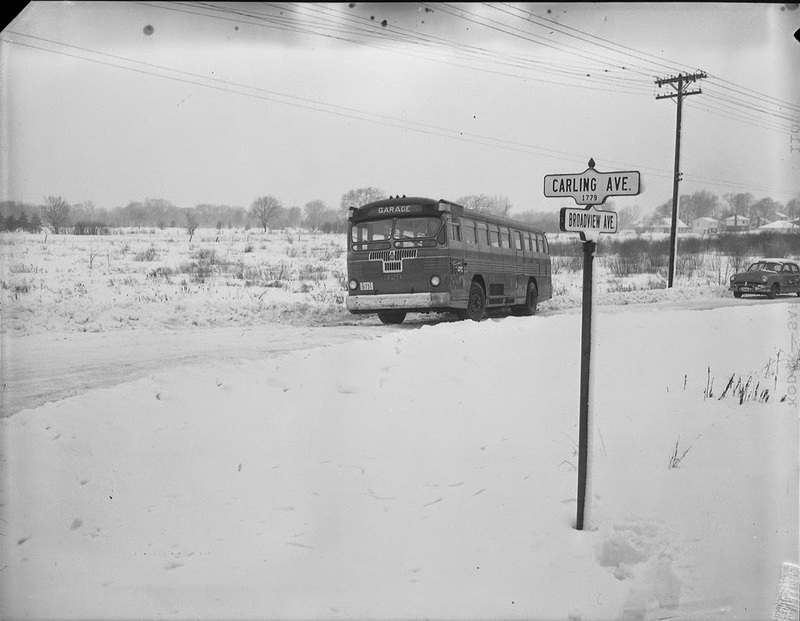 Regular streetcar service began on May 24th, 1900, and would run until May of 1959. 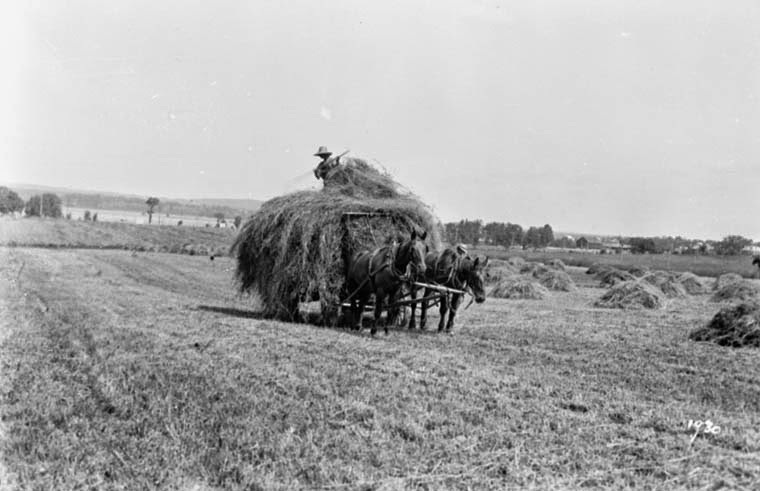 1911 was a huge year in the transformation of McKellar Farm. A local group of businessmen, led by coal dealer Gordon F. Hodgins, had formed a syndicate and came to an agreement to purchase the farm sometime in late 1910. It was officially registered in the spring of 1911, but the group (the McKellar Townsite Company) wasted no time in drawing up a plan for the community, and kicking off an aggressive advertising campaign in the newspapers of Ottawa. 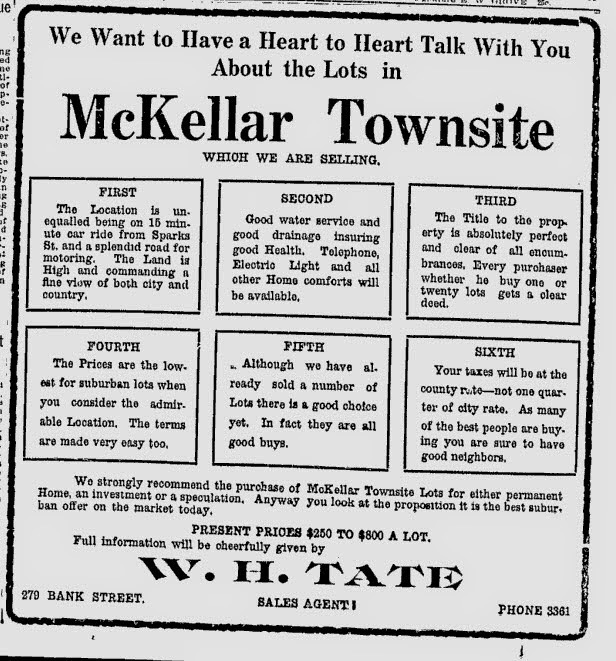 Advertisements for lot sales began to run in mid-January of 1911, and the McKellar Townsite Plan (plan M-29) was officially registered with Carleton County on June 14th, 1911. The plan created 1,029 lots in McKellar Townsite on seven new streets running north-to-south from the River to Carling Avenue. The Townsite Company hoped to cash in on John Cole’s recent success in selling real estate in Westboro and Highland Park. The company graded the roads and in 1912 installed 24,000 feet of cement sidewalks. The lots were equipped with electric light and heating, and water was sourced from artesian wells (where pressurized water naturally rises to the surface). The company also opened a quarry on the property and supplied building stone at cost to lot purchasers. Streets would be given proper names in the final plan filed in June of 1911. The future Fraser Avenue appears here as "First Avenue" at the top. McKellar himself had no involvement with the McKellar Townsite Company. He sold the land but kept two lots as his own, on which stood (and still stands) his historic stone mansion, as well as a second stone home built during the 19th century. McKellar moved into the smaller home (later known as the "Wayside Inn"), and sold the mansion in 1911 to John Bingham, Managing Director of the Ottawa Dairy Company (and thus is why the home is now known as the McKellar-Bingham House). McKellar died just three short years later, but in that brief time span was able to witness the fast development of the subdivision which bore his name, on the land he and his father had farmed for the past 40 years. But back to Fraser Avenue (or First Avenue, as it was known then), The first lot sold in the entire McKellar Townsite was on First Avenue, lot 38 (now the site of 543 Fraser Avenue), sold to Mrs. Margaret MacLeod for the sale price of $400. However, the lot would not be built on until the 1950s. The first structure to be built on First Avenue itself was constructed in late 1912 or early 1913 at the very north end of the street at the water's edge, by Harold W. Jones, Chief Tidal and Current Surveyor with the federal government. This house, 371 Fraser Avenue remained until expropriation in the 1950s. Bob Grainger in one of his excellent columns in the Kitchissippi Times describes the house in greater detail, and I've borrowed a photograph of it from his column at right. However, on a technicality, this is not really be the first built home on Fraser Avenue. 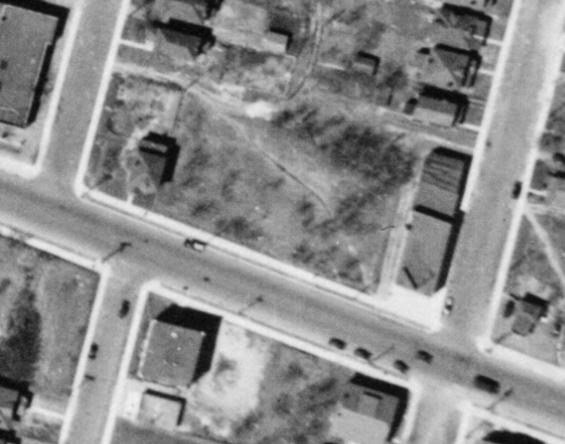 The small portion of the street north of the CPR tracks near the River actually became it's own individual street over time, and in 1950, this portion was renamed Banting Avenue. Bob Grainger does a thorough job in covering the history of that portion in 3 columns at the Kitchissippi Times which I recommend you check out (http://kitchissippi.com/banting-avenuethe-street-that-time-erased/). This little segment is best identified in the little map below taken from the article (note the map does contain one error, as the "Fraser Avenue" line is identified incorrectly. Fraser is the road just to the left. But the map still does the job to show the Banting separation well). This area north of the CPR tracks would be expropriated in the 1950s anyhow, for the creation of the River Parkway. So unfortunately, this segment of the street has disappeared and with it, all of its stately riverside homes that once existed here. For the Fraser Avenue which still remains today, the first two homes built are both still standing in 2015. They were built at roughly the same time: 551 and 623 Fraser. Construction on #623 commenced in June of 1913 by millwright Percy Ellis Harris. 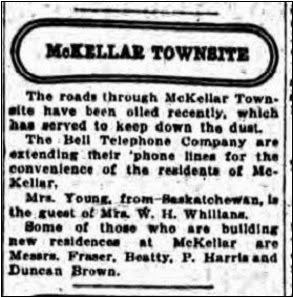 The Journal even made mention of it in their short column on the Townsite (along with the even more notable mention of the pending arrival of telephone lines to McKellar residents!). 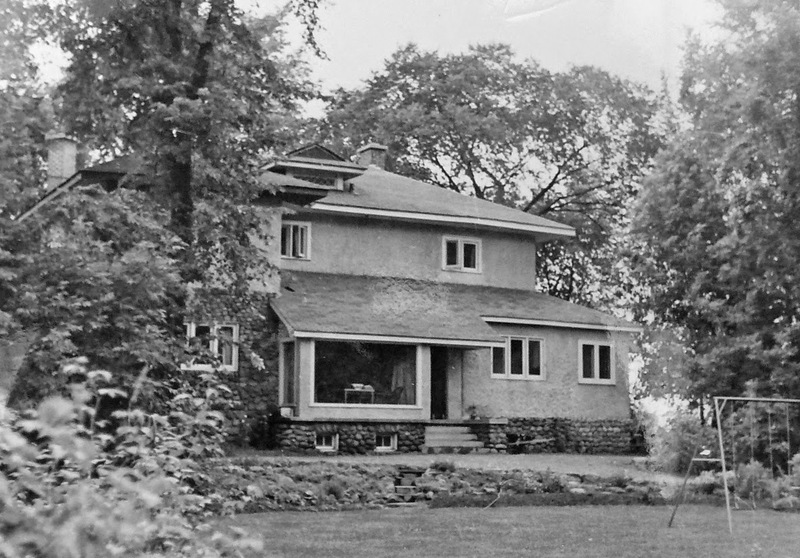 Meanwhile, in July of 1913, Robert and Mary Ann Fraser purchased lot 40, took out a mortgage for $2,000, and began building what would become #551 Fraser Avenue. 623 Fraser is pictured at left, a gorgeous shot of this historic Fraser Avenue home in the 1930s. The building restrictions of the time are quite interesting. Subdivision owners would often include them as part of a sale deed, to ensure only a certain class of home and occupant would reside in the subdivision. 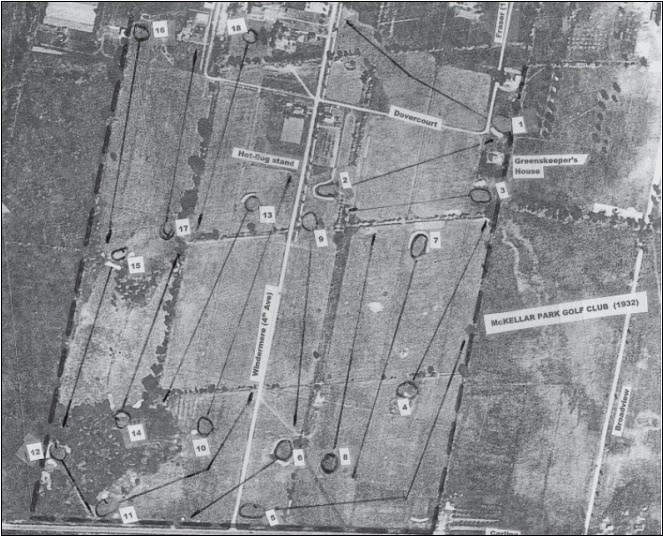 The McKellar Townsite Company had a lengthy list of restrictions: "Only one single or semi-detached house to be erected or constructed on each lot according to present survey. Each house must be constructed of brick, brick veneer, stone cement, or if frame, must be clapboarded and painted on outside. All buildings must have stone or cement foundations. No building to be less than 1 ½ stories in height. No business to be carried on upon the land hereby transferred which shall be a nuisance to the neighbourhood, or which will depreciate the value of the property in the vicinity. And any building erected upon the land hereby transferred at any time prior to the first day of January, A.D. 1925 must be of the value of at least Two Thousand Dollars ($2000.00) exclusive of out-buildings when complete, and all water-closets erected upon the said lands hereby transferred must be enclosed in a wood shed or other shed or building, and under no conditions shall any such water closet be exposed to public view. Each building shall be at least twelve feet from the street which it faces. No signs allowed on the within mentioned property without the written permission of the Company." This era cannot be discussed without including a note on the tragedy which occurred on June 25th, 1913, when a long west-bound C.P.R. 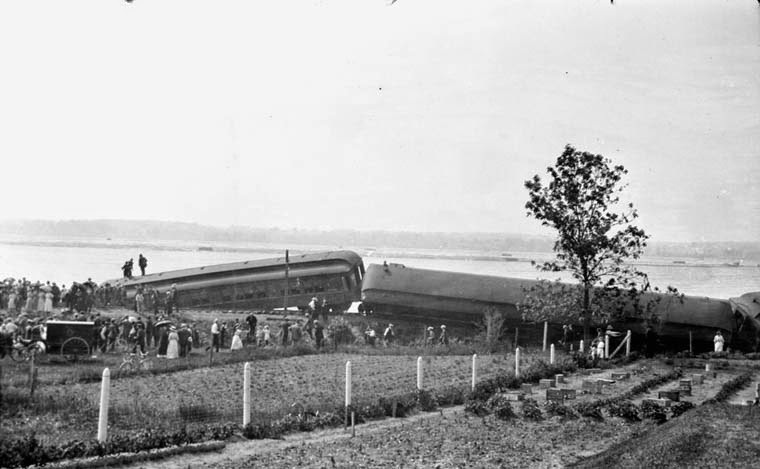 Express train headed to Winnipeg filled mostly with new immigrants from Scotland and Ireland, who arrived in Montreal from Glasgow that very morning, derailed, killing 11 and injuring 40. The derailment occurred within a few feet of Fraser Avenue, by the River's Edge. It is uncertain whether 551 or 623 Fraser was completed first, but certainly by early 1914, both houses were occupied. 555 Fraser next door to 551 was not far behind either. 551 Fraser, the original Fraser family home, pictured at left. Builder Percy Harris resided in 623 Fraser for a few years before selling to William A. Bond, patriarch of the long-running Bond's Decor business, in 1918. The Bond family would remain in this home until 1957. The Frasers (at 551 Fraser) would go on to raise their four children in the home. 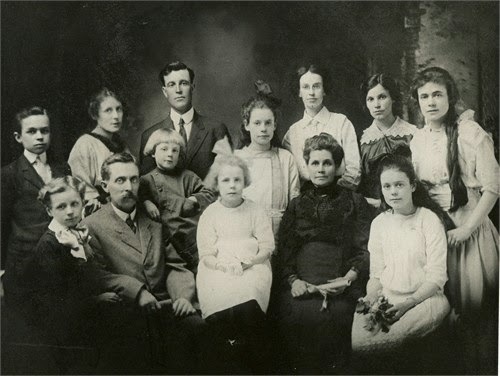 Robert passed away suddenly in 1936, while the family was temporarily living in Alberta. His widow and children returned to the house and remained until September of 1943 when they moved for good. As an obvious show of respect, when the streets of McKellar Park were all required to be renamed in 1944, the name "Fraser Avenue" was selected for the former First Avenue. Overall the street was fairly slow to develop. It was not until post-WWII that the construction boom took off. By 1948, the streets of McKellar Park were still quite sparsely populated. A quick snapshot of the area from the 1948 Fire Insurance plan, showing the area behind Nepean High School between Crossfield and Keenan show Westminster, Mansfield, Fraser and Denbury still with lots of room to grow. Unlike a lot of streets in Kitchissippi, where a corner store or shop frequently would open to serve nearby residents, there appears to have never been a merchant operating on Fraser Avenue over the years. However, one "business" that operated for many years which obviously must be mentioned in this article is the McKellar Park Golf Club. 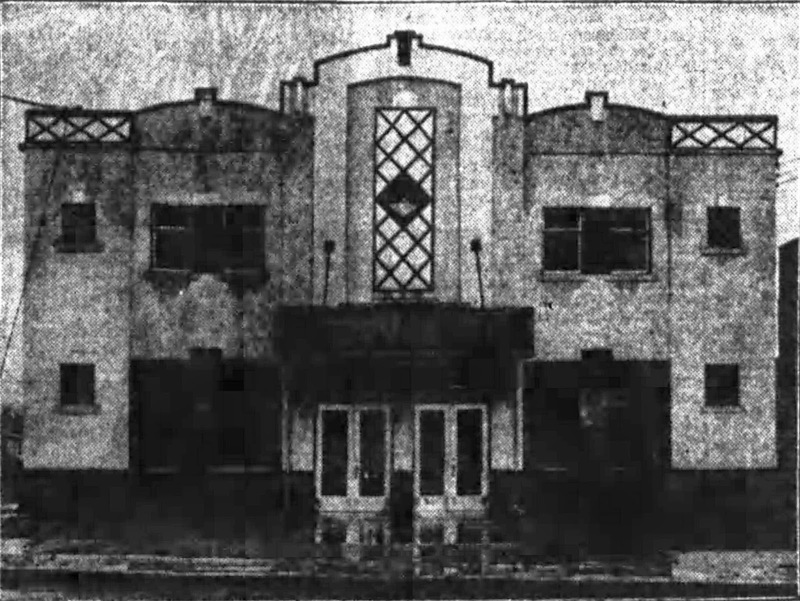 The Club opened in the summer of 1927. It was an 18-hole, 6086-yard club, which would have present-day outer boundaries of Carling Avenue on the south, Courtenay Avenue on the west, Keenan Avenue on the north and Fraser Avenue on the east. The course began just next to the Bond's home at 623, with the green of the first hole located mere feet from the house. Tom Unsworth Sr. and Jr. were the course caretakers, and lived in a home on Fraser just north of Dovercourt, which was built around 1932 (633 Fraser). I've incorporated the map from the story below, which shows well the location of the course (as well, if you take another look at the photo I posted the other day of the barren fields at the intersection of Broadview and Carling, you can now place a golf course on this spot once the snow dries up). house, as well as the 3rd hole, is labelled as being just south of Dovercourt. 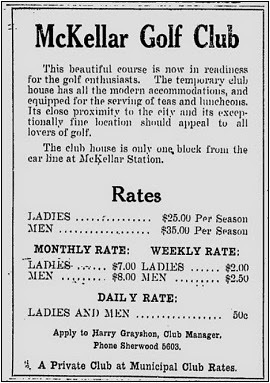 Sadly, in 1952, a decision was made by the City of Ottawa, and its city council, led by Mayor Charlotte Whitton (the new owners of the McKellar Park Golf Club following the recent annexation from Nepean), that the city of Ottawa would not operate a municipal golf club, and that the land was too valuable. The course was last played on in 1952, and though there was a great call from the golfing community to keep the club open in 1953, even into the spring of 1953, the city closed the course, and soon after sold off the property for housing development later that year. 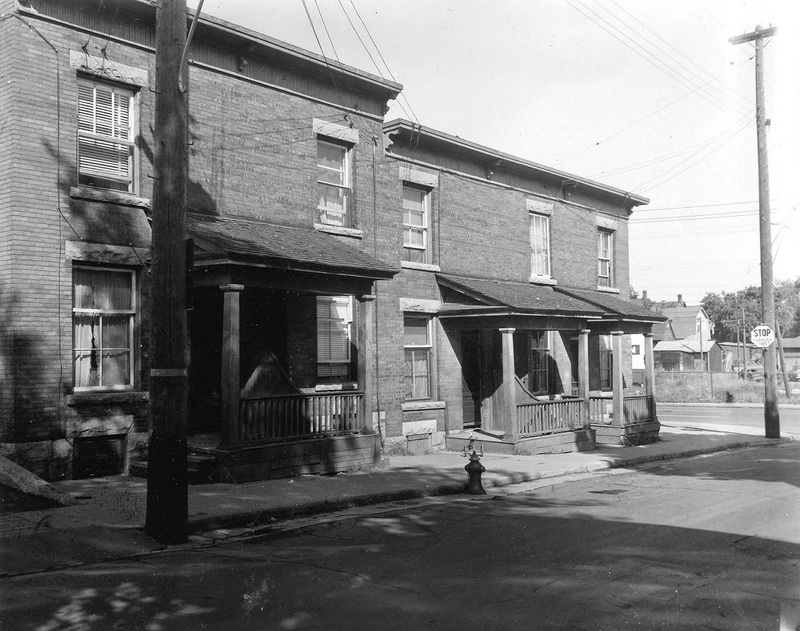 Fraser Avenue south of Dovercourt was very quickly built up with homes within a few short years. To close off this look at Fraser Avenue, I am sharing a couple of amazing photos which were so graciously shared with me a while back from the family albums of the Bond family. Mr. George Bond, one of the friendliest gentleman I've ever met, and a true McKellar Park historian, had these two great photos showing the McKellar Park subdivision in its infancy, I have yet to see a photo like it, showing what is now such a full and mature neighbourhood, nearly 100 years ago. Mr. 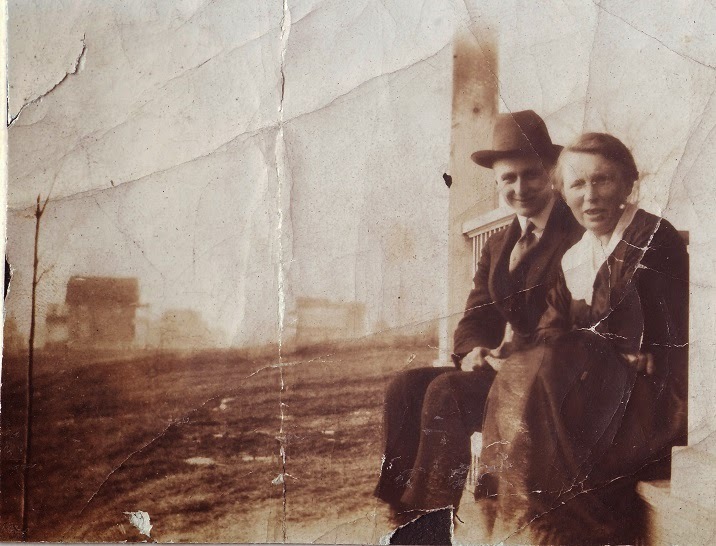 Bond estimates the photos were from when the family first moved onto the street in 1918. Given the minimal growth to date, that date would be pretty close. This is Mrs. Bond and her brother, sitting on the porch at 623 Fraser. The photo is looking north up the street. can be seen at right, and a home on Westminster in the distance at left. A classic photo from about 1952. I don't know why someone took this photo, but I'm glad they did. The eerie past life of the Ottawa Bagelshop! The Ottawa Bagelshop on Wellington Street is a Wellington Village institution. Growing up in the area (on Gilchrist Avenue), this was one of my family's main shopping spots during the 1980s, when Wellington West was not at all what it is today. I particularly remember Sunday mornings, when it was the only place that would be open east of Westboro and west of Holland Avenue. It was perfect for a kid who wanted to get a newspaper to view the hockey statistics and scores from Saturday night's games (the newspaper used to be the only way to do this, pre-internet! ), or when my parents wanted hot bagels for Sunday breakfast. The Bagelshop was (and still is) the place to go. It opened in April of 1984 when Vince Piazza opened the shop selling "Montreal style bagels" after learning the trade at his brother-in-law's St. Viateur Street store in Montreal. It was in 1996 that the shop expanded to the neighbouring building, which previously had been the Ottawa Church of God and (along with the Peace Finders Gift Shop inside the front lobby). The two buildings had actually been completely separate before, and the renovation connected the two buildings, making it appear as one complete structure. So the eerie past life of the Bagelshop resides in this "new" part of the Bagelshop (the restaurant portion). 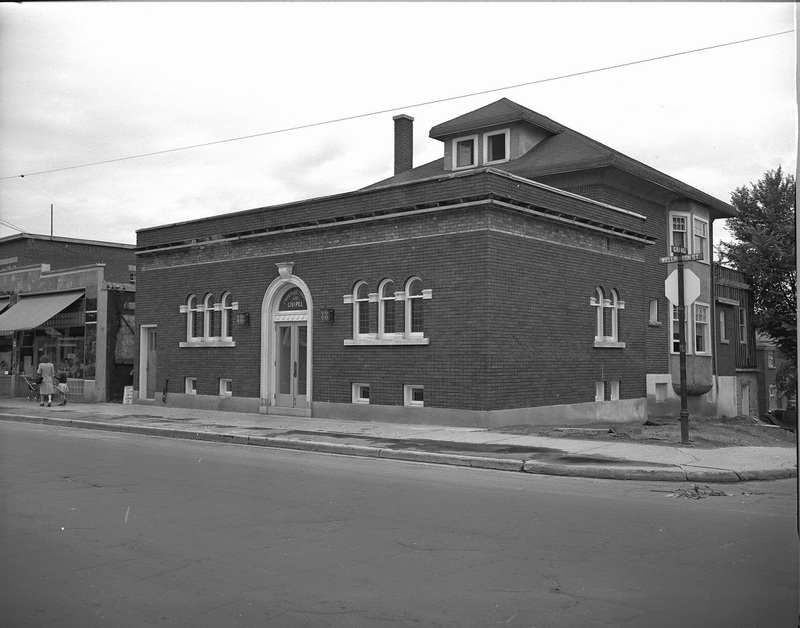 You might be surprised to know that for 45 years, this building was a funeral home! The Radmore Stewart Funeral Home opened in 1930 in the main floor of a large home built in 1922. It was around this time that the way funerals were organized changed. Prior to the 1920s, it was common practice that when a family member passed away, the post-death care, funeral and wake services were all performed within the family home. It wasn't until after WWI, when the process of embalming was popularized for soldiers being returned home for burial, that the bodies of the recently deceased were moved into funeral homes shortly after death. 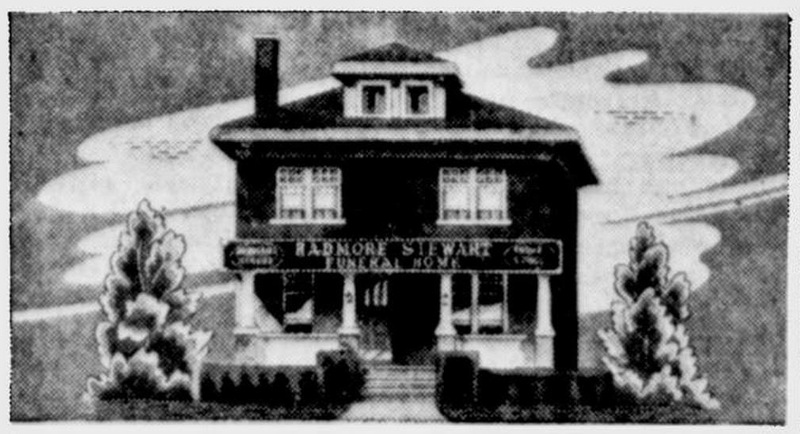 George Radmore Stewart saw a need for a funeral home in the west end, and opened his small business in a converted house at what was then 1323 Wellington Street. The photo below shows the building as it was in 1943. If you take a good look from across the street, you can still see the loft windows looking quite the same. garage at the time. 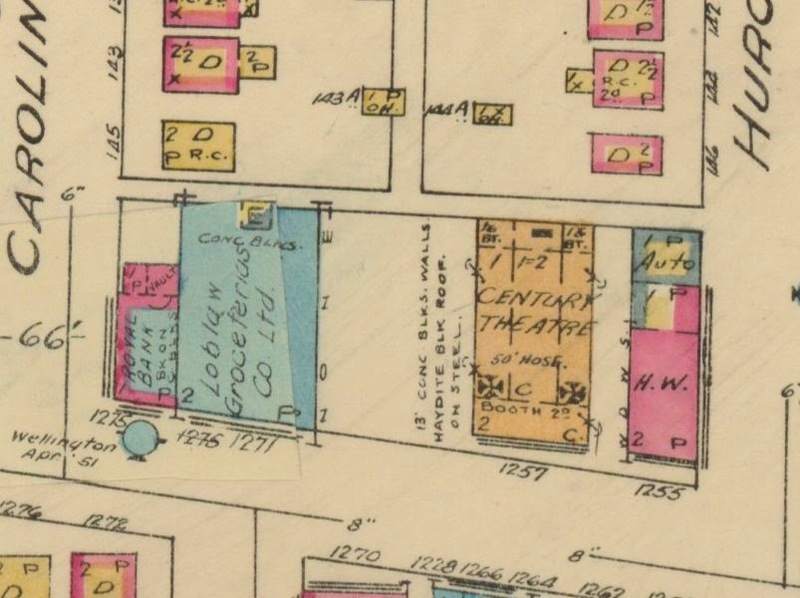 The main Bagelshop building would later be built in the adjoining vacant space, and the next building to the west is the Gastropub building (built 1923). Across the street, where the Parma Ravioli now exists is a big "V" which was likely a large-sized advertising billboard. 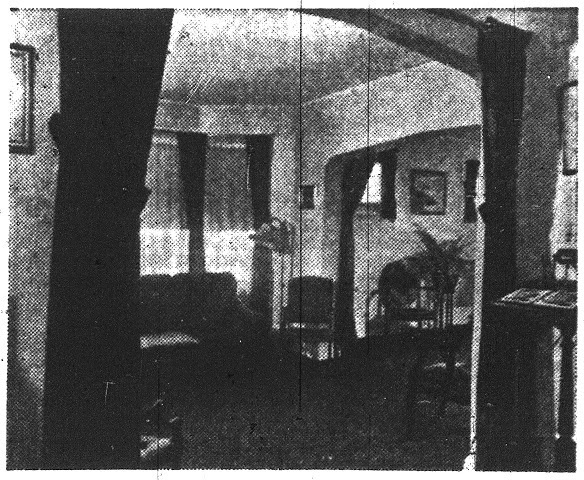 A view of the family reception room in the original funeral home at right. 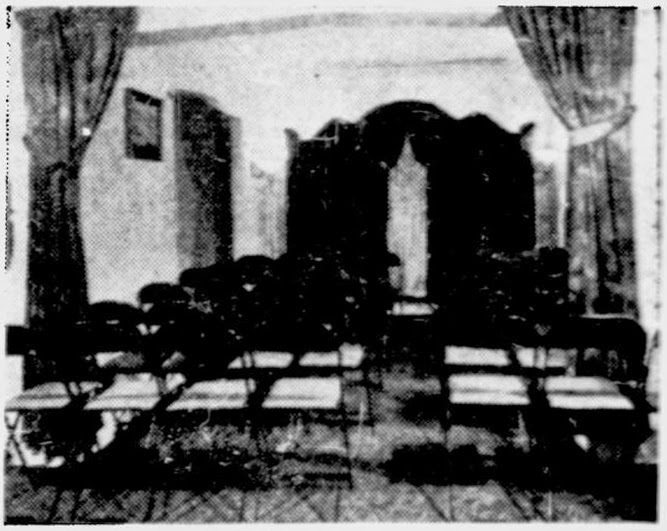 The original funeral home chapel 1930-1947. (My apologies on the quality of some of these photos, they are taken from old photocopies and/or newspapers. I did the best I could with them). 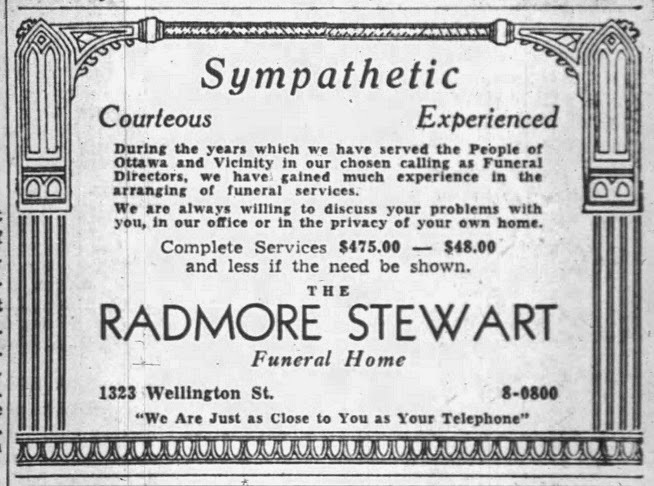 At right is a vintage ad from the Ottawa Journal, promoting the range of affordability a Radmore Stewart funeral could offer. "$48 and less" sounds like quite a bargain, though I can't imagine what a less-than-$48 funeral would have gotten you! For 17 years, the Radmore Stewart parlor operated in the small converted home (one of the sons and his wife even resided upstairs), before demand led to the construction of a new chapel addition, which opened in the summer of 1947. 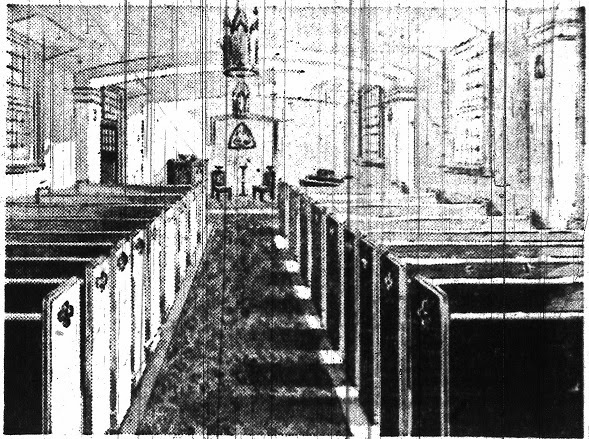 At left is a view of the interior of the Radmore Stewart chapel in 1947. Radmore Stewart closed in late 1975 or early 1976. The location briefly became a Lebanese community centre, before the Sahara Dining Lounge opened in 1978. The restaurant did not last long, and it was taken over by the Church of God by 1981. Meanwhile, next door at 1321 Wellington (the Bagelshop store portion) was built in 1945, and opened in April of that year as the new location of Armand Cloutier's local gift and variety shop (specializing in greeting cards, school textbooks and even radio repairs), having moved from 1244 Wellington (where Nectar Tea is now located). This shop would become a landmark of its own in West Wellington, remaining as Cloutier's until 1980. It briefly became the Wellington Travel Agency and Home Fashion Centre, before the Bagelshop opened in 1984. And now you know the unique past life of part of the Bagelshop building! This is the first of what I hope will be a popular regular series that I plan to do on this blog. Once a week, I plan to run a profile of a street in Kitchissippi. I'll write about it's earliest beginnings, how it was born, when it was first built on, and discuss some of it's significant residents, houses, buildings and businesses. For my first street profile, I have selected what I consider to be one of the more interesting streets in the history of the area. But it isn't one you would have expected. I was also inspired to choose this street by the suggestion of a high school friend who realizes that the street still has meaning to her, even years after her family has since moved away. Stirling Avenue is a relatively short street that kind of bisects Hintonburg between Wellington and Scott, and has an unbelievable amount of interesting history stuffed into its 1,400 foot length. A perfect representative of the wild and crazy history of Hintonburg itself. Name meaning: According to "Ottawa Old & New", it was named after Stirling, a City in central Scotland. 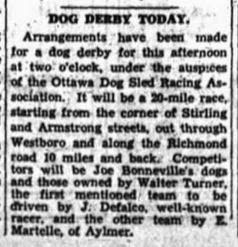 How named: Hintonburg was annexed to the City of Ottawa in December of 1907, and many streets required renaming. This was done by the Board of Control in 1908, likely under the recommendation of the outgoing Hintonburg town council. The history of a large portion of Hintonburg ties directly back to the land of former Scot Mr. John Anderson, who in March of 1831 acquired 100 acres in the north half of lot 36, concession 1 (many years before it was Hintonburg). The Andersons settled on the land, before John died in 1849. His widow, the former Janet Gilmour began selling off portions in the 1850s, before filing one of the earliest subdivision plans in Carleton County. She registered Plan 14, at the age of 80 in September of 1861, just a month prior to her death. The Plan was an interesting one, as it split the remaining 80 or so acres of her land, into 8 blocks (numbered with roman numerals). Each block had a different width and length, which is very curious. Anderson then transferred a block to each of her eight children. At the time, one would not have envisioned Hintonburg becoming as thickly populated as it is now, and the intention was likely mostly to provide these parcels of land, 6-10 acres in size apiece, for her children to establish either small farms or large homesteads in the rural setting outside of Ottawa. Block VI (6), comprising a little over 7 acres, was given to daughter Agnes (married name Stewart). Agnes did not built on the lot, but maintained it for 10 years before selling in 1871 to Frances Magee, a widow and early Nepean Township settler who acquired a number of pieces of land. She was a trailblazer indeed, being a female real estate prospector in this era. It was in May of 1873 that Magee laid out what was registered as "Plan 43" at the Carleton County Registry Office. As each land-owner was free to lay out their subdivision as they wished, Magee chose to simply run a thin street down the center of the lot, and offer lots on either side. 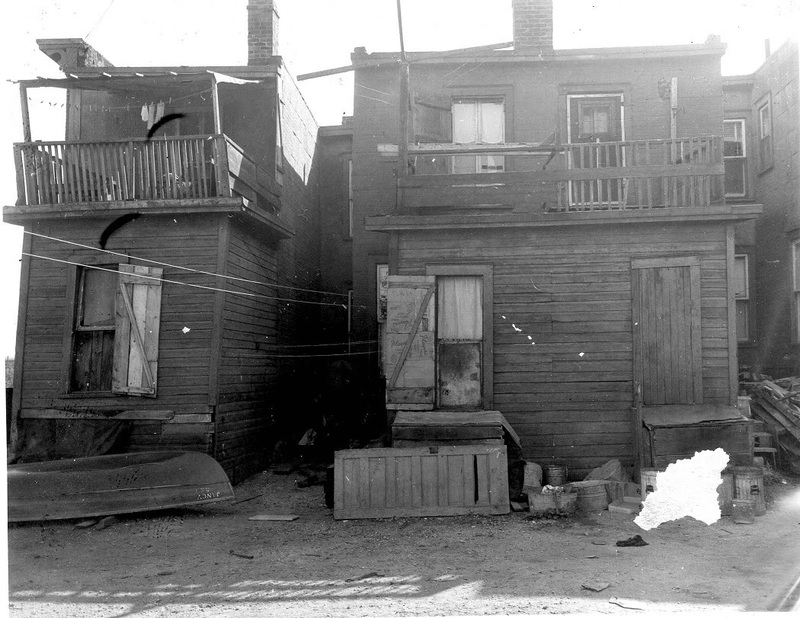 The street was called "Centre Street", and a total of 43 lots were drawn up, most being of 99' deep and 66' wide. This background is part of a very detailed history of the early days of Hintonburg, but is excellent evidence of why the neighbourhood has a very unique layout of streets and lots. Essentially, Richmond Road existed well before any development began, and all growth happened around it's existing route. But as the area developed through a series of individual packets of property that were stitched together into the tapestry that became Hintonburg, it speaks to the character of the neighbourhood that makes it such an appealing place to live, with such an interesting history. Magee conducted lot sales through her agent James Clark until her death in 1883. The lots fronting on the popular Richmond Road sold immediately in 1873. Richard Woodland, a butcher, purchased lots C, D, E, and 1 at the northwest corner of Richmond Road; while Peter Harvey, a blacksmith, purchased lot A. These lots were sold for roughly $100 apiece. 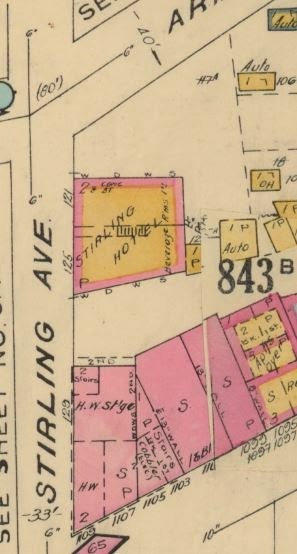 The Scottish-born Peter Harvey would be the first to build on the plan, constructing a small 1 1/2 storey wood-frame blacksmith shop fronting Richmond Road just east of the corner of Stirling (approximately now where the Al Jazeerah shop exists at 1101 Wellington) sometime in 1874-1875. The blacksmith shop would remain in this location until about 1910, later operated by David Moodie (1877-1890) and Thomas Blanchfield (1891-1910). The other businesses fronting onto Richmond Road on Plan 43 would be built soon after as well. Magee House (the wonderful stone house still standing at 1119 Wellington) was built around 1880, and Francis H. Gilchrist's shop at 1111 Wellington (now Heaven's to Betsy) was built in the mid-to-late 1880s. 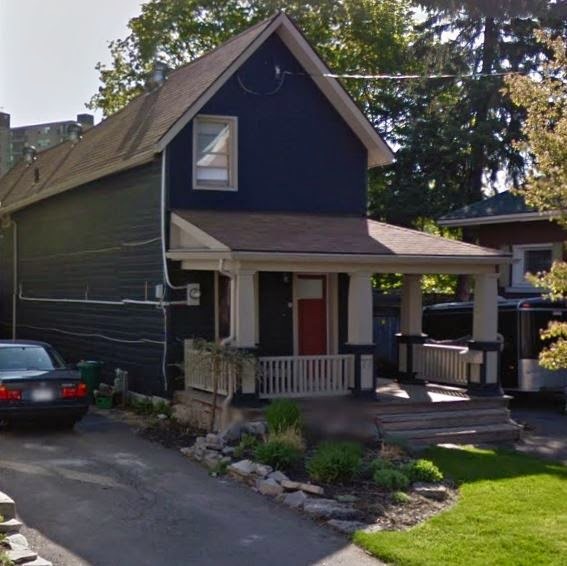 However the first houses that actually fronted onto Stirling Avenue itself were constructed between 1876 and 1877, when established builder Samuel McArthur built a larger 1 1/2-storey semi-detached house on lot 3 (formerly 108-110 Stirling, demolished in the 1990s, now the location of the newer row townhouses at 110 Stirling), while stonemason Richard Mathews built a smaller house on the north half of lot 5 (now the site of 92 Stirling), which was demolished sometime between 1902-1912.
on Stirling Avenue, now 133 years old. 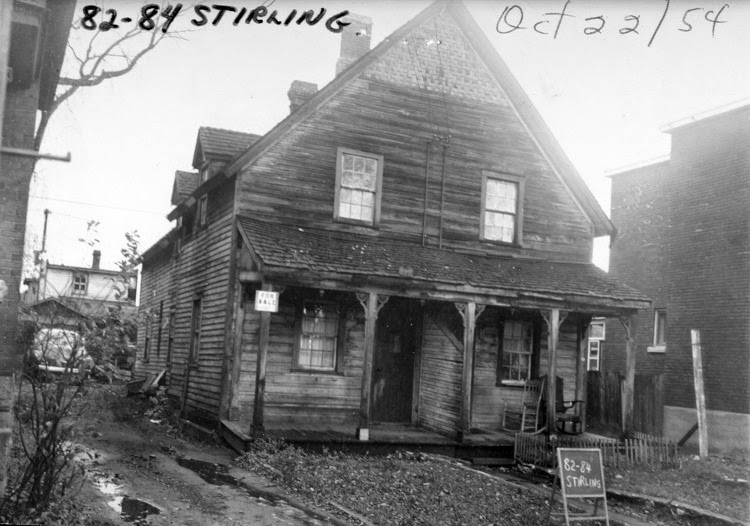 The oldest home built on Stirling still existing today is 77 Stirling, on lot 32, built by Thomas Mathews in 1882. He would also build the house at 85 Stirling (which still remains today) a few years later. Mathews was a stone mason, and the brother of Richard Mathews, who had built across the street. 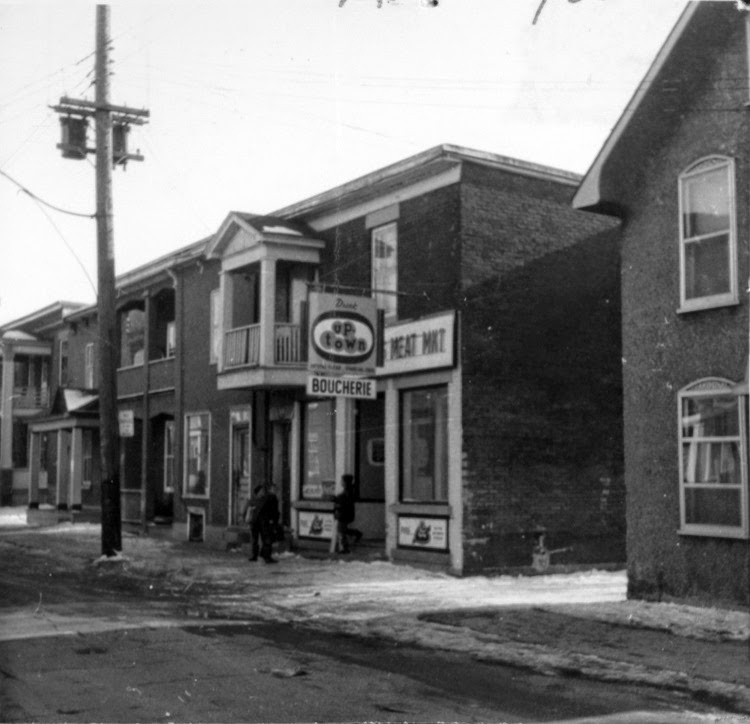 Development occurred quickly on Stirling Avenue, indeed as it had throughout Hintonburg during the boom of the late-1880s. By 1892 there were 32 completed houses on the street (compared to just 5 in 1885). No history of Stirling would be complete without mentioning the infamous Stirling House tavern and hotel, which operated at the south-east corner of Armstrong and Stirling from 1935 until the early 1990s. Part of the building actually began life as a movie theater built between 1911 and 1912. 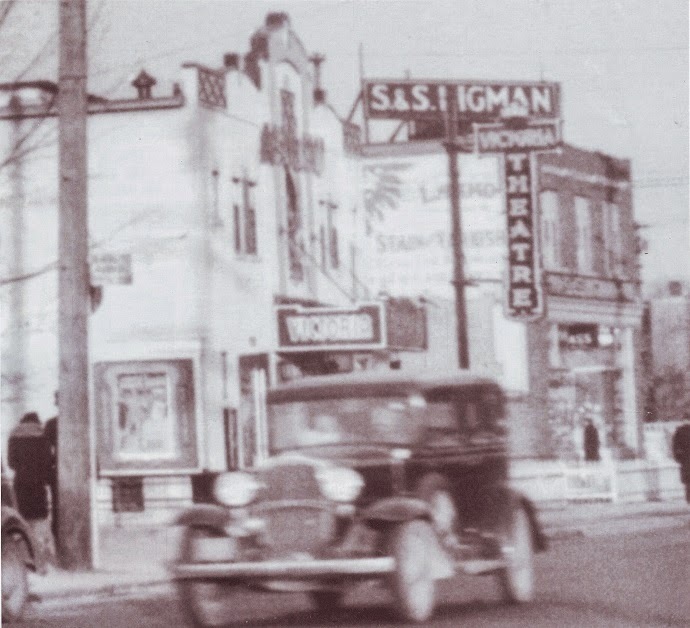 George Ventura who would go on to become a projectionist for 40 years in Ottawa theaters operated the "West End Theatre" at 123 Stirling Avenue during the era of silent films. 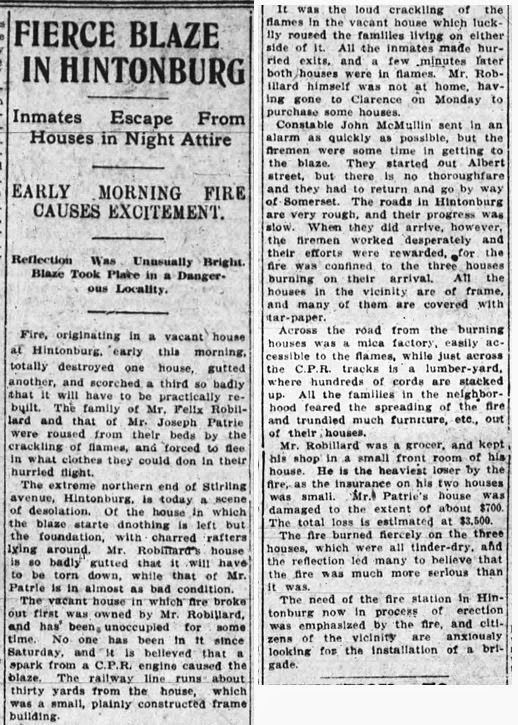 The small 1-storey wood building must have been an incredibly eye-opening site to visit for Hintonburg residents while it was open from 1911 until about 1915. 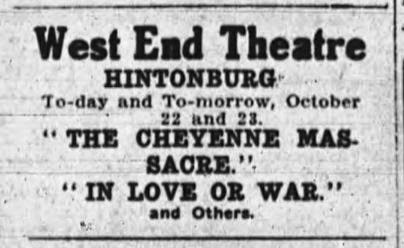 October 22nd, 1913 promoting the Theatre. The site would be used for various purposes over the next 20 years, including as an auto garage, paint shop, and as a butchers shop! In fact it was a butcher by trade, Joseph Bonneville, who had been operating his butcher shop out of the building in the early 1930s while residing in the small house next door at 125 Stirling, who created the Hotel. 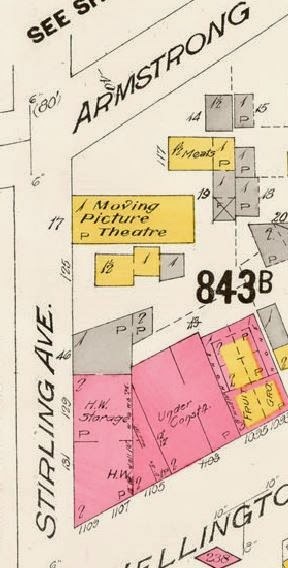 Bonneville took out a building permit in August of 1935 in order to demolish his small house, and expand the existing former theatre building into a bricked 2-storey and double-wide hotel and tavern. By early 1936, the Stirling Hotel was open for business. 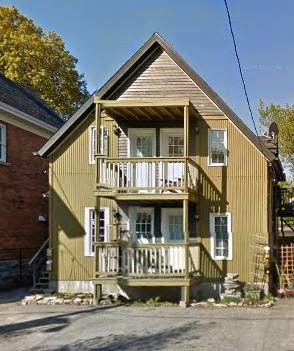 For those of you unfamiliar with the lore of the Stirling House, it is absolutely legendary in Hintonburg. While I was much too young to have ever been able to visit the tavern while it was open, I do remember driving by in my childhood, and hearing some of the stories about it from my Dad and grandfather. 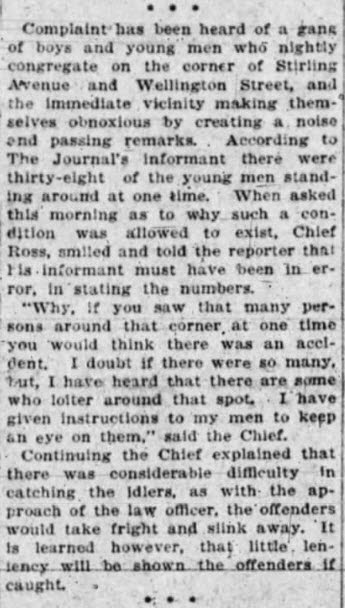 The newspaper archives are chock-full of unbelievable stories as well. It seems that barfights were practically a daily occurrence, and the local police were regularly called in for disturbances big and small. 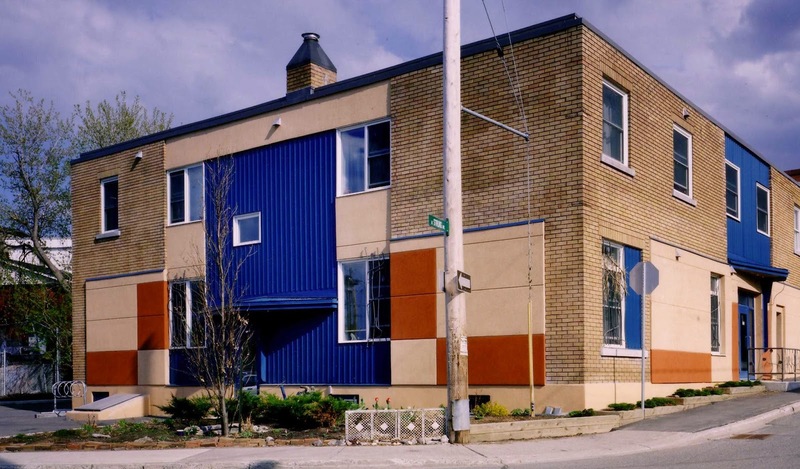 After finally closing down in the early 1990s, when the Hintonburg transformation was just in its early stages, the building sat idle for many years, until the CCOC purchased it for $2, renovated it and converted it in to housing. So it is thanks to the CCOC that we can still walk by the building today and reminisce, and have this piece of history intact from such a unique and important part of Hintonburg's past. Other businesses have existed on Stirling Avenue over time. As was common in the late 19th and early 20th century, small grocery shops were operated out of front living rooms. Many of these came and went over the years, often not lasting more than a year or two. However, a couple of stand-out businesses did remain longer term and are worth memorializing here. 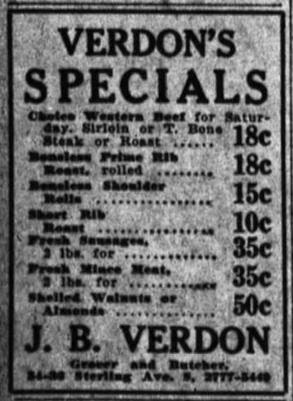 In 1905, Jean-Baptiste Verdon opened a large grocery store, butcher shop and wholesale tobacco business out of his home at 38 Stirling Avenue. He established quite a complex of different small additions to the three houses at 34, 36 and 38 Stirling, it must have been quite a maze to investigate. J.B. Verdon passed away in 1938, but his son Conrad kept the family business running until the late 1960s. The photo below shows the business as it was just before they were demolished. The site is now a community park that runs the full length between Stirling and Carruthers. At left is an old ad from the Grocery & Butcher Shop from 1924. The building on the north-east corner of Stirling and Armstrong (105-107 Stirling) has long been the site of various mercantile endeavours. Auguste Roy built the house around 1891, and remained there until he died at the amazing age of 98 in 1958. He operated a cab company out of the home from 1889 until 1939 (I guess he would have started off with horses before switching to automobiles as the times changed). He also operated a restaurant out of the building commencing in the late 20s or early 30s, which was taken over by local businessman Joseph P. Nolan after his retirement in 1939. It later became the Stirling Grocery Market, and Cal's Confectionery. By the mid-1950s it became the Brentwood Vacuum Cleaners and Repairs shop, Morrison Refrigeration in the 60s, and likely had a few other names and purposes before converting to exclusively residential sometime in the 1980s. In 1933, the St. Francois D'Assise Separate School opened up at 12-24 Stirling Avenue, providing a larger space than what the school had previously had at the Irving Avenue location. This school was used as an art gallery by the late 1980s and became the Odawa Friendship Centre in 1996, but of course is now under renovation to become part of a larger condo structure. To the north of the school, where the gymnasium was just recently demolished, used to be a row of houses built in the mid-1890s as rental housing. They actually managed to stick around until the 1960s, and were literally falling apart when the City of Ottawa forced their removal as part of their Urban Renewal initiative of the late 1950s. The photos below were taken in 1960 shortly before they were demolished. Both a view from the front of the house and rear are shown. And this below is just another cool old vintage photo I once found of 82 and 84 Stirling Avenue in their 1954 glory. While doing final editing on this blog, I was actually a little surprised to see the house still exists today, nicely refinished! This house was also built by Richard Matthews, sometime around 1888-1891. To conclude this look at Stirling Avenue, I thought I would do two things. Firstly, I wanted to write a paragraph on the original 98 Stirling Avenue, which has since been replaced with a new build. 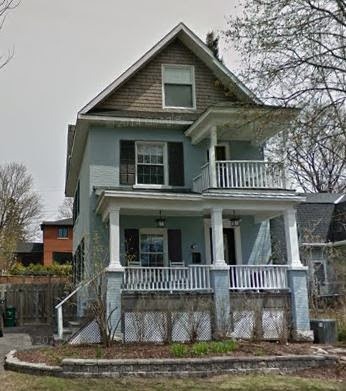 This was the house which my old high school friend had still felt a connection to, and in doing a quick research of its history, found it to be a perfect representation of a Hintonburg home. The original 98 Stirling was built during the winter of 1888-1889 by Samuel McArthur (the same builder mentioned earlier who had built one of the first two homes on the street in 1876; he also had built the original town hall on Parkdale and several other notable buildings in Hintonburg). McArthur was building up quite a collection of properties which he rented out to tenants. The house was given the number 59 Centre Street (interestingly, prior to the annexation to Hintonburg, all of the houses on Stirling were numbered in the opposite way, with odd numbers on the west side, even numbers on the east). The first occupants were Edmund Thompson, a 36-year old millwright from Lochaber, Quebec, his wife Hannah Scobie, and their five children. Hannah died in April of 1892, giving birth to their sixth child. The Thompsons moved out around 1894, replaced by Leonard Sauve, a lumber culler, and his young family. This began a chain of events typical of homes in the area, where the houses were sold often, and occupants changed practically every year or two. To list every owner and occupant of the house would take literally paragraphs. But the people share almost all of the same basic characteristics: francophone, working class, young with growing large families, such as Eustache Lacroix (1900-1906), Louis de Bourgogne Routhier (1906-1910), and Jean Fissiault (1910-1913). 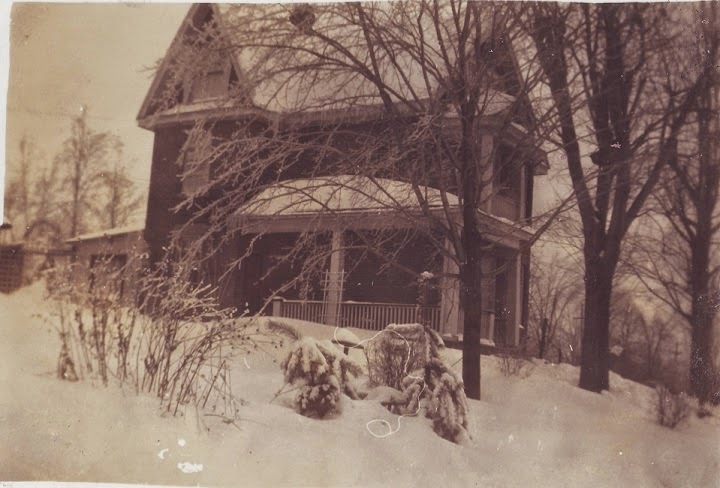 Most notably, in April 1913 the house was purchased by Wilfrid Blais for $650. Wilfrid was a carpenter, and the director of the Catholic Order of Foresters. He and his wife Alvina would remain in the house for 34 years, raising their TWELVE children, and (at the time of Wilfrid's death in 1944) 36 grandchildren and 7 great-grandchildren. The Blais family sold in 1947 to Adelard and Alexandrine Dinelle. Adelard was the proprietor of Dinelle Rug Cleaners at 839 Somerset West. The Dinelle family would remain until November of 1980, selling for $25,250 to Daniele Bourbeau, who flipped it a little over two years later in January of 1983 to the Clarke family for $47,000. The original house was replaced between 2002-2005. To close, I thought I would attach a few interesting newspaper articles about Stirling Avenue from various points in time which show just how far we've come in 100 or so years, and how crazy some of Hintonburg's past really was. Click on any of the articles below which will load up a filmstrip where you can view them in a larger size. Cheers and enjoy! Your input is always appreciated!